The reasons for the disparity are clear. While metros face stiff competition from competing electronic and online media for readers and advertising dollars, smaller papers often are the only vehicles for news and advertising in the communities they serve. Because it would not be cost effective for interlopers to compete in the compact and typically isolated markets served by small-fry publishers, they have greater advertising market share and more control over their rates than metros. The ability of most small papers to sustain their coverage will be a major factor in helping them preserve the strength of their franchises, putting them in a position for future growth that the big guys will surely envy. Getting by on the 25k a year these places pay would be the challenge, of course. This doesn't seem to be the case in suburban Philadelphia. Papers there are being hammered. Alan, are you familiar with the San Francisco Neighborhood Newspaper Association? When something gives at The Chronicle, do you think they could change their ways and thoroughly cover the city? Survival of the fittest will be dictated by the quality of the content and the audience each paper retains as a result. In the UK I hope that a number of poorly edited local papers will fall by the wayside, leaving room for the local press that really delivers valuable news and innovative services to readers. The 2% revenue decline mentioned here does not square with my information on several smaller papers in various regions. 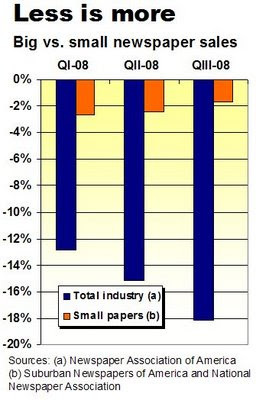 While it might be true for the very smallest dailies (10K circ and below), I'm seeing ad revenue declines in the 10% vicinity among papers in the 20K to 50K range. I see this in my local community in the Catskill Mountains, 100 miles north of NYC. Starting with the weekly Woodstock Times a few decades ago, Ulster Publishing has built a network of several community papers. They share some regional content, but all are focused on long-form, comprehensive coverage of the issues that matter to their individual towns. Each paper is supported by the same events listings & classified ads section across all the pubs. They are as thick as ever, and I'm proud to put down my 75 cents or dollar once a week to spend an hour reading cover to cover. One big difference between the successful small papers and the failing large papers: the small papers don't give away their content on the Web, and they do not allow Google to link their stories. It has long been my contention that giving away news content on the Web is the equivalent of committing suicide. It has been great for the bottom line of Google, but not for newspapers. People read newspapers to get news. If they have seen it before, it's not news and they aren't going to waste time reading it. An interesting exercise for SNA would be to break out the layoff totals by "smaller newspaper company." I'd wager you would see some very large layoff numbers at the suburban chains - even though they only represent a small percentage of overall local newspaper businesses. Those chain papers, many of which are located in the same metro markets as their larger brethren, face the same competition for readers and ad dollars and consequently are cutting newsroom resources and other staff just as fast. The conclusion drawn from the statistic in this post is not telling the whole story. Perhaps SNA has their own headline wrong? Shouldn't it be, "Location, location, location." Wait until the fourth-quarter numbers come in. Also: the classifieds business is going away in these smaller markets. It'll just take Craigslist a little longer to reach the smaller towns. I agree with anonymous. If we posted all the local news on our website and gave it away, why would anyone subscribe to our small hometown newspaper. We have a website, with information on how to subscribe and just enough hometown news to entice people, mostly former residents, to subscribe. I don't know if it's possible for a small (under 2,000 cir) weekly to make money off the Internet. Our 8,000 circ weekly has felt the downturn, partucularly in real estate and auomotive advertising. But we haven't cut staff or the quality of the newspaper. I agree wholeheartedly on the idiocy of giving content away on the internet. We offer free three full stories, all the heads and update breaking news, obits and provide full access to classifieds, but require either a paid print sub or a web only sub to access the complete content of the newspaper. One emailer grumbled that tne Washington Post and NY Times gave free access. I told them we made money last year and they didn't. Newspapers in South Dakota are once again fighting the yearly battle of public notice publication. This year the State has joined the city, school and county government entities to allow public notices to be posted to websites in lieu of publishing in the official legal newspaper of the governing body. All as a means to 'save' money and move legals out of a 'dying' media source. Are other states encountering this type of reaction to the ‘so called’ demise of the newspaper industry? Re: last poster. In New Jersey they're trying the same thing, nominally to save money but also because a lot of local officials would just love to stick it to the town-area paper. Re: the first poster- Amen! Sometimes it's not even 25K. And in my old company editorial was forbidden from moonlighting (even at a non-competing pub), nor could you get a set schedule that would allow you to get a second job. Little papers make money at the expense of the editorial and pre-press folks who actually produce the damn things.